Rec. Studio 2, Radiohuset 7 October 2003 (1, 4-6), The Engelbrekt Church Stockholm, 26 May 2004 (3). �Immeasurable Traces� is a well packaged SACD hybrid CD, with some attractive minimalist artwork in succulent blues and reds. This promising presentation is reflected in the musical content, which displays a variety of stimulating and rewarding electronic and electro-acoustic music. Rolf Enström says, "My art lies in a borderland between pictorial art and music � where the images are missing." It is of course the listener�s imagination which provides his or her own imagery, and with the wide palette of sounds on this CD the aural experience calls up a rich source of associations and mental landscapes. Many of the pieces here are based around the human voice, and the opening piece �Rama�, which uses texts and quotes from Shakespeare and Arthur C. Clarke, begins with subtle whispering over a satisfyingly resonant electronic soundbed. Slow motion choral �water-fall� effects mix well with, and are subtly entwined through the electronic sounds the nuances of which provide sometimes chilling juxtapositions with a disembodied voice quoting in Swedish from poems by Gunnar Ekelöf. The choral writing is often beautiful and expressive, and the electronics are always sympathetic � sometimes having been sourced using voices from the Stockholm Motet Choir, an idea which always helps integrate tape sounds with live performers. The whole is powerfully atmospheric rather than dramatic, and is one of best electronic pieces I�ve heard for quite a while. The first three works here are a trilogy, and the second of these, �Kairos� was written in 1999 as a �musical drama� for radio. Once again, text and voice are central. While the spoken Swedish might be slightly alienating, one can revel in the reader�s rich voice while a multi-layered sound narrative unfolds in convoluted waves. I�m a little less enthusiastic about the slightly obvious �fader flapping� here, and a so-called lute which sounds like a fairly straightforward �lead� sound from a Roland keyboard. �Kronos� brings back live vocals, and the five strong ensemble �The Purifive� have a counter-tenor enriched early-music sound which calls the Hilliard Ensemble to mind. Deep bell-like resonances are combined with percussive shocks and the computer-processed voices of The Purifive singing work by Thomas Tallis. This layering of live and electronically manipulated voices once again provides an effective link between the two sound-worlds. The constantly shifting and tidal nature of the waves of sound are an apt illustration of the piece�s subject; time. The following group of pieces came as a result of an initiative from Stockholm�s Saxophone Quartet, and comprises three works for saxophone solo and tape. In �Saxplock�, the saxophonist Jörgen Pettersson sounds as if he his wrestling with his bass sax inside a big electronic bag full of nasty noise-monsters. �Ebb� uses the alto sax, and consists of a kind of jazz recitative over swirling electronic noises, which are subsequently reinforced with rhythmic drum sounds. The drum machine is just �parachuted� in however, and the piece tails off with more saxophone meanderings accompanied by the now familiar bell-like resonances. Enström protests that pulse, tempo and rhythm have been �forbidden� in electro-acoustic music, but he would need to develop the idea further than this if he intends to buck the trend convincingly. �Tide�, the last of the trilogy, uses stabbing soprano sax notes and some fairly nondescript warbling from the electronic stock cupboard. Supposedly working with quarter-tone scales it adds little to the canon of micro-tonal music. An unmemorable contribution, but with the advantage of brevity it does provide a little light relief. The past piece, �Observatoriemusik�, brings us to a world which is tailor-made for electronic treatment � stars, space and the planets. This is the most purely electronic piece here, having been generated from an initial algorithm whose function was to filter white noise, allowing the composer to sculpt new sounds from random noise. My audio equipment unfortunately doesn�t run to SACD surround-sound, but I can easily imagine the quadraphonic effect of this piece to be quite overwhelming. At one point the sounds merge and unify into a rising, phasing column of noise which almost guarantees the �goosebump� factor I�m sure many of us seek when listening to this kind of music. The distant stretched chiming of much of the remaining material provides the listener with everything one might expect from the vastness of the subject. I�ve enjoyed this CD immensely, and recommend it to anyone interested in modern electronic music or contemporary music in general. 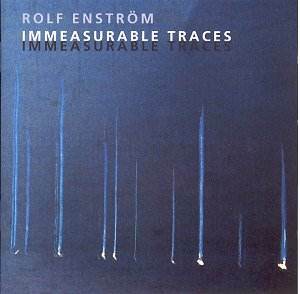 Rolf Enström is self-taught as a composer, and while this always sets off alarm-bells (especially when it comes to electronic music) there were only a few spots where I felt that structural tightening might have strengthened the works. However any such criticism would be nit-picking.